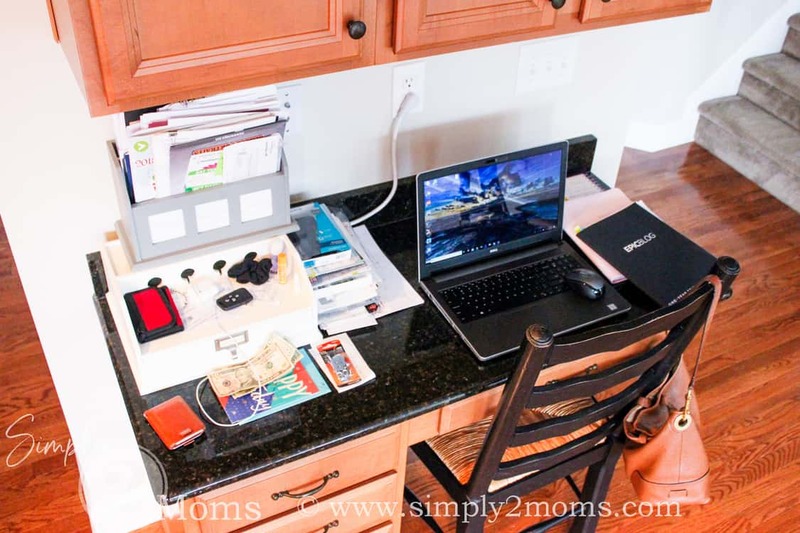 Did you know there is a National Clean Off Your Desk Day? Neither did I…but there is and it was this week. While Anne & I were researching Instagram & blog post ideas we came across the National Day Calendar. So. Much. Fun! There’s a day to honor practically everything. As I looked over at our family desk in our kitchen I knew what had to be done! It was a mess! 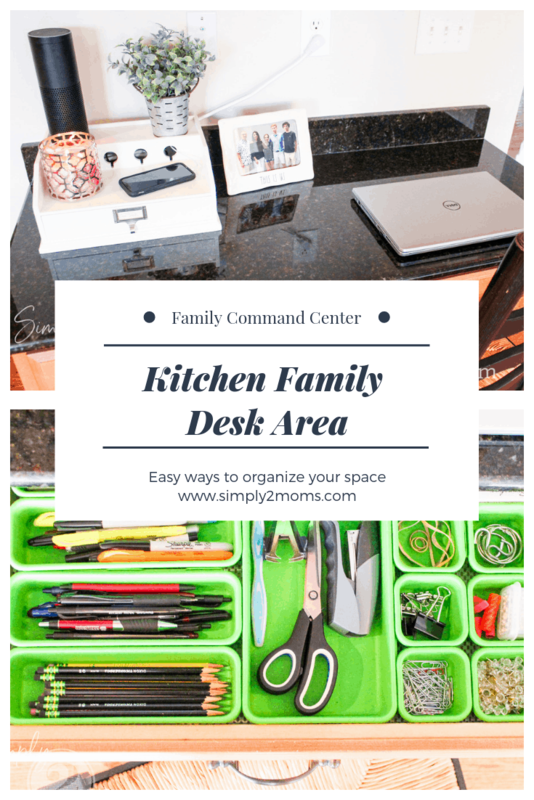 It’s great to have a desk area in our kitchen as part of our family command center but unfortunately, it becomes a dumping ground for everything and anything we don’t know what to do with. 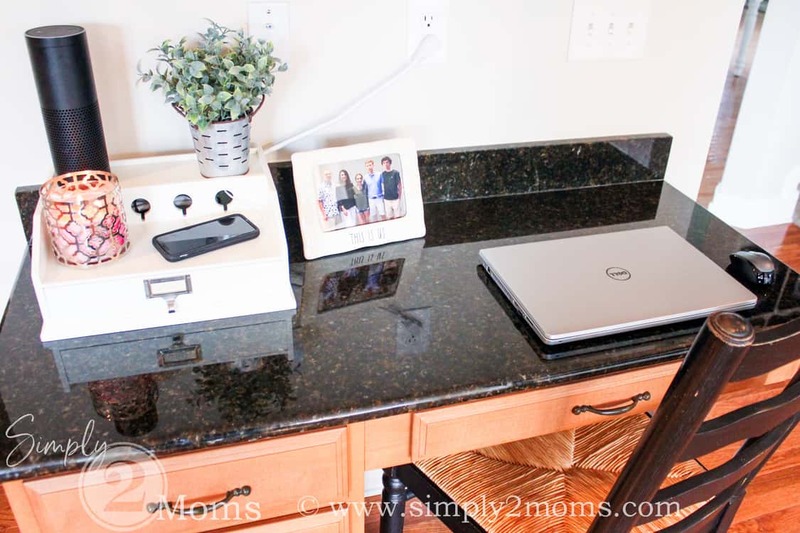 I shared the other part of our command center in this post. 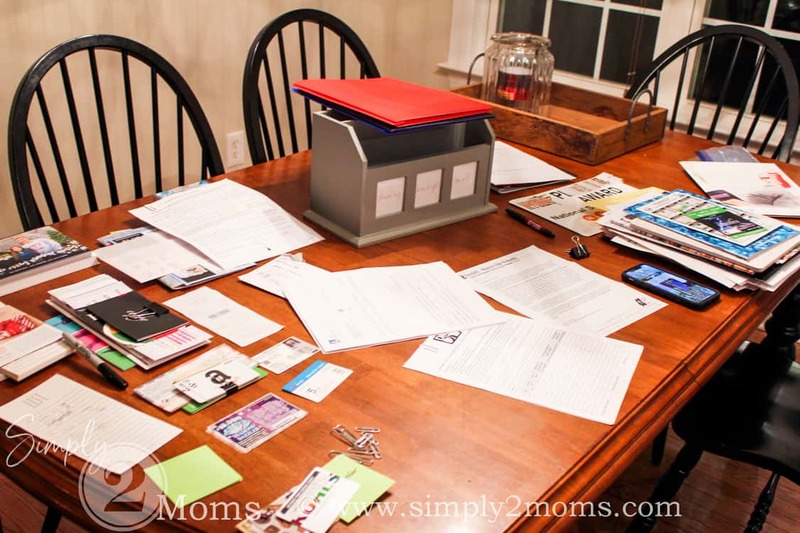 Do you drown in paper clutter? We do! I thought that cute gray paper sorter was the solution. It wasn’t! Turns out it was just another place to stick more paper we didn’t know what to do with. And it was so full I couldn’t fit another piece of paper in it. So we resorted to piling more paper on the side. Every few months this desk really starts driving me crazy…and only me…no one else in the family seems to care. I do love that white charging station that I’ve had for well over 10 years. 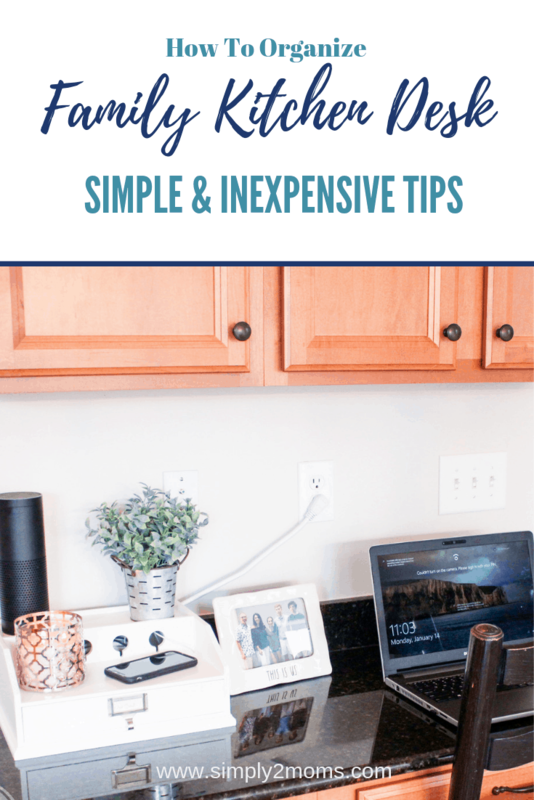 My sister has the same one and it always looks so pretty in her kitchen because she has it styled and not as a junk collector! 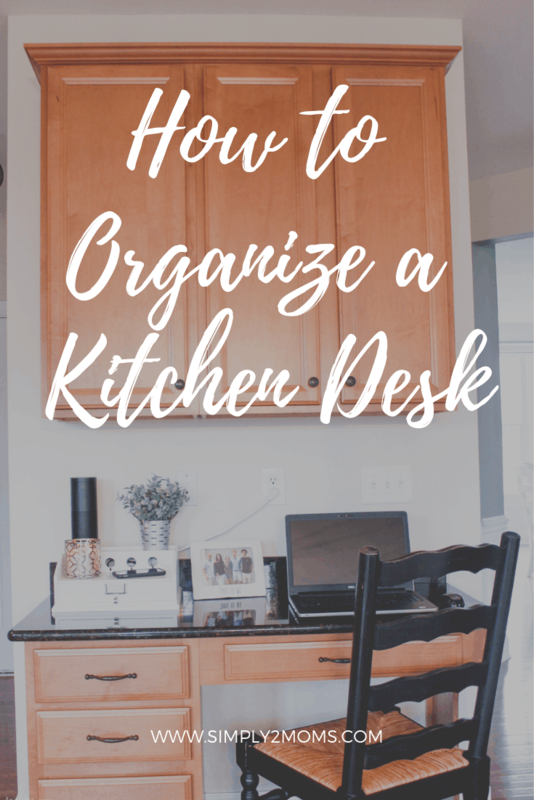 My mission was to clear the paper clutter and make the desk pretty but more useful. I’ve been working at the kitchen table because there wasn’t much space to spread out at the desk. Inside the cabinets wasn’t so bad. Using boxes and paper bins to sort like items helped keep them organized. 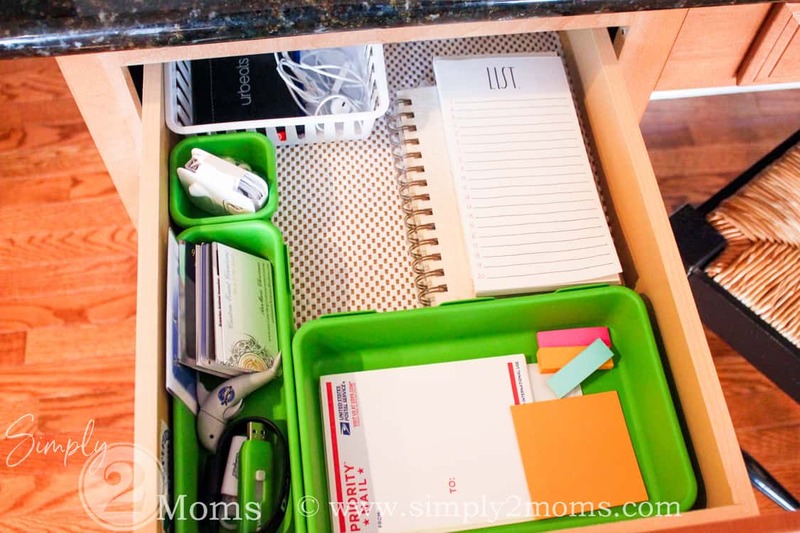 Just like the cabinets the inside of the desk drawers wasn’t terrible either…I have small bins in the drawers to organize our family desk supplies. I won’t bore you with the before pictures of each drawer. You’re welcome! The cabinets and drawers just need to be cleaned up and made a bit more functional. The first step was to take all the papers from top of the desk and sort it into manageable piles. Honestly, most of the paper went into the recycle bin. But some were moved to our box of sentimental paper so that we can keep it. I’m a bit of a mush like that. Other papers we need to keep easily accessible so I stored them in folders that I labeled to go back into the cabinets. Isn’t it lovely? So neat, organized, and pretty. I’m going to work really hard to keep it this way. Fingers crossed! 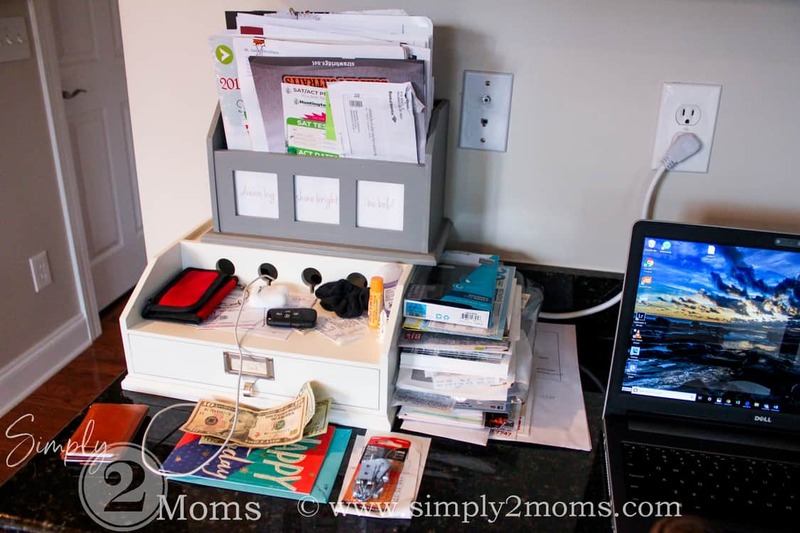 On my to-do list, will be to find something to cover that ugly cord and phone outlet. 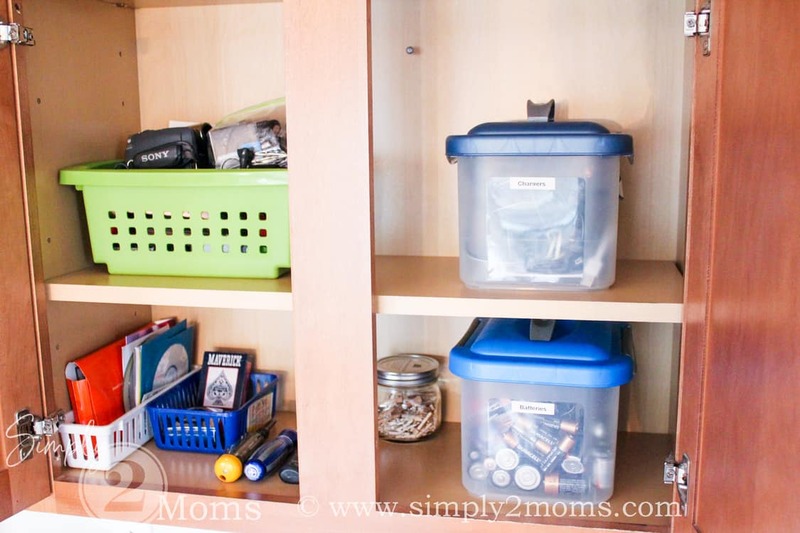 Just straightening up the contents of the cabinets using the storage pieces I already had made a big difference. 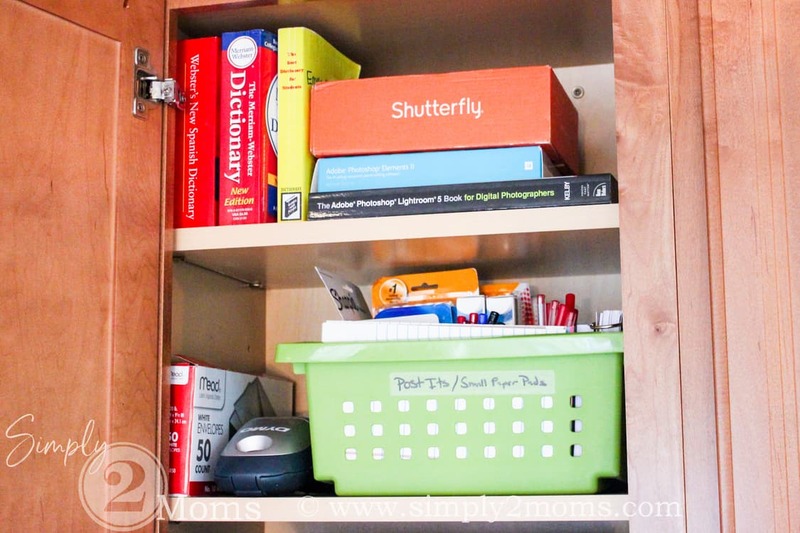 Let’s take a closer look at how I organized the contents of our desk cabinets. 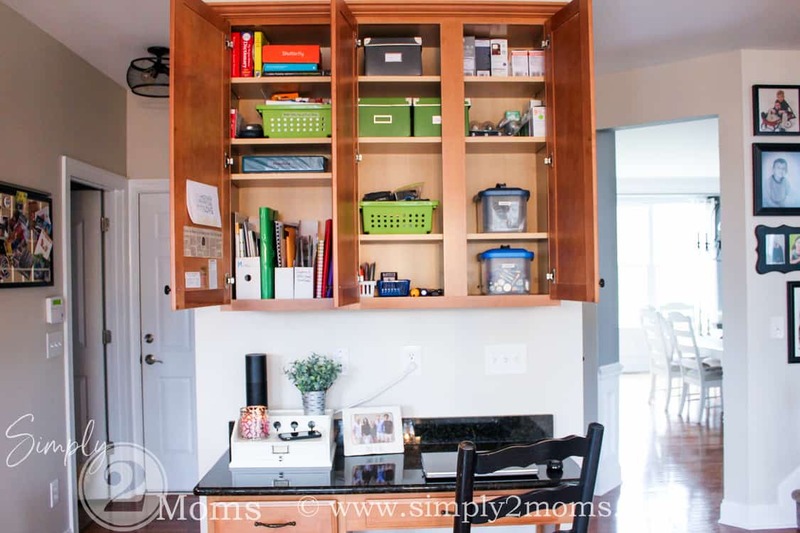 The top two shelves in the left cabinet store books, envelopes, label maker and a few extra school supplies. Looks like I need to use that label maker to replace the handmade scotch tape label on that green plastic basket. Haha! You can find plastic baskets similar to ours here. The bottom two shelves store the all-important paper. 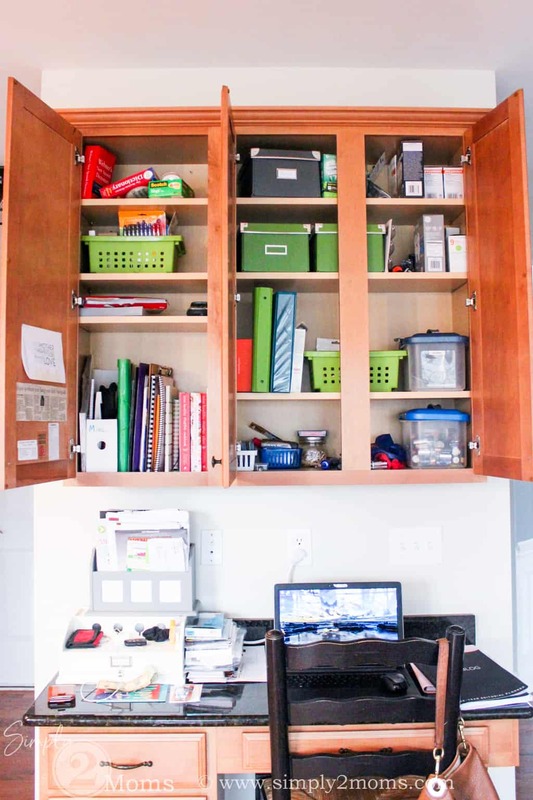 We keep that binder for all our instructional manuals that come with appliances or fixtures in our home. 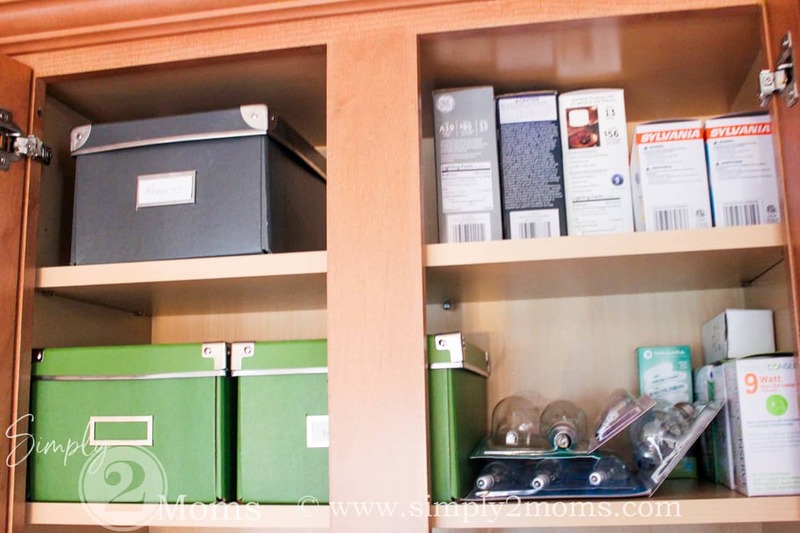 The bottom shelf isn’t super pretty but it’s functional and organized for our needs. 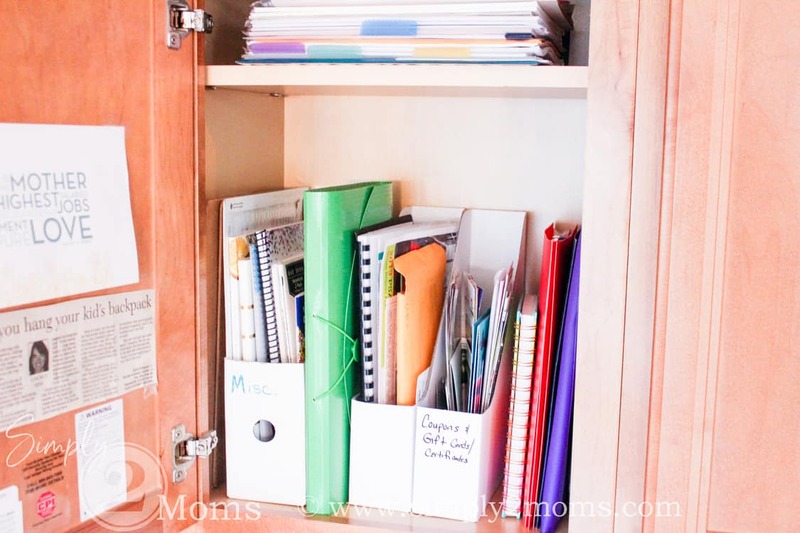 We store a folder for each of our kids with papers we may need to access for them such as sports schedules, school information, etc. The paper magazine holders store coupons, notebooks, and other important documents. The top two shelves of the double cabinet stores light bulbs (looks like I may need a basket for those loose packages). The paper boxes store greeting cards & writing paper, banking supplies, and a memory box where I can stash random pictures or cards. Similar paper storage boxes can be found here. Finally, the bottom two shelves store our video camera, GoPro and accessories, a few tools and bins for batteries & chargers. And that battery bin is used quite often for the Xbox. I could store the batteries up in our bonus room where they play Xbox but then I may never see my 17-year-old. Haha! Just kidding…he’d still have to come downstairs for food. I’ve used these bins for years. When the kids were little they were perfect to store small cars, dolls, or collections of all sorts. They loved to carry around their stuff to play with anywhere they went. In the past several years we’ve been storing all our random chargers for electronics in these bins. This way when we need to charge our Kindles, cameras or the kids graphing calculators for school we always know where to find the charger. So Simple! 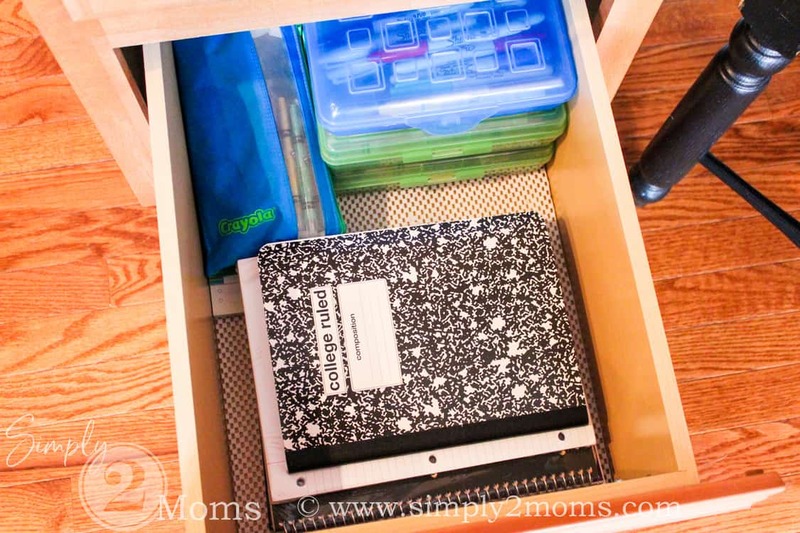 All three drawers on the left side of our kitchen desk store household and school supplies. 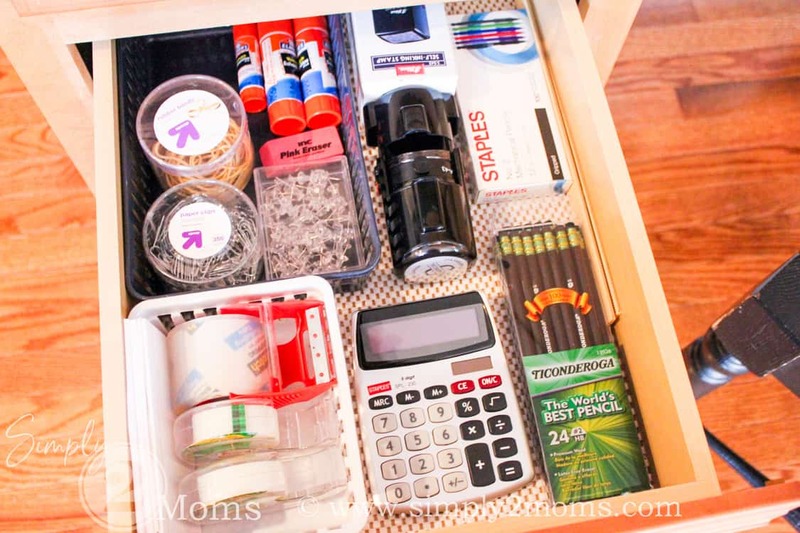 These are the drawers that get the messiest over time. So I just need to reorganize them from time to time. But the middle top drawer stays fairly neat. My family doesn’t share my love of keeping pencils and pens separate! Those bins are labeled on the bottom with what goes in each one, however, when they are full they can’t see the label. 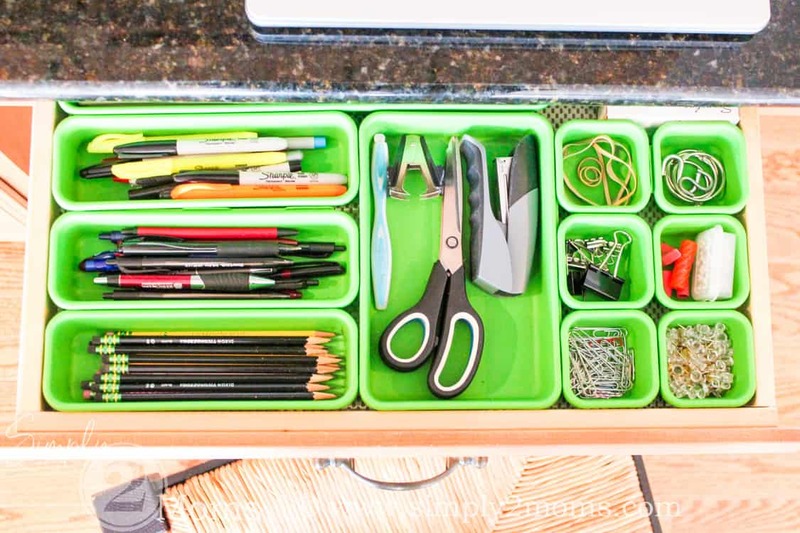 These are the same bins I use to organize my desk drawers. And if you’re looking for the absolute BEST pencils ever…the Dixon Ticonderoga are my favorite! I think it’s kinda funny that I’m so neat in some areas like the inside of my desk drawer (that no one ever sees) but the top of the desk was a wreck! Haha! But kinda like reorganizing the dishwasher after my family loads it…I may just move pens that are thrown in the wrong bin into the correct one! Now that the top of our desk is cleared off, I was able to style it with a few items I had already here. 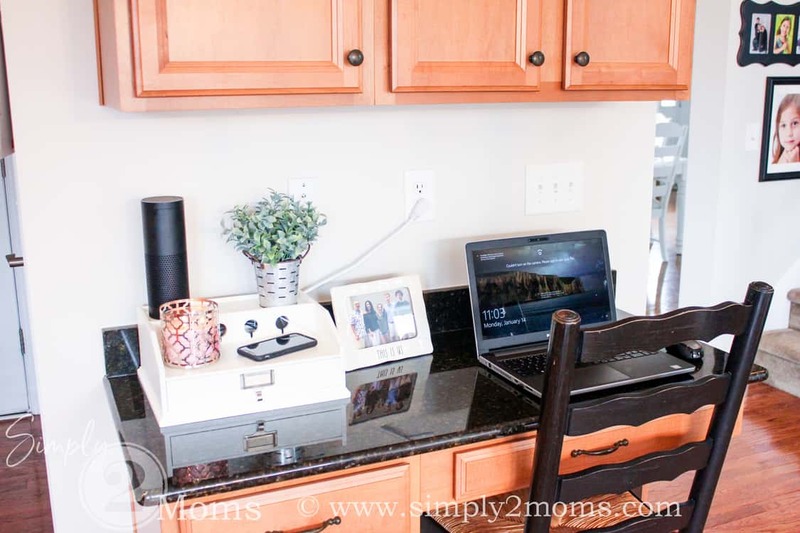 I moved our Alexa off the window sill over the kitchen sink (which I never liked in that spot because of the cord hanging down) and can now hide the cord in the charging station. 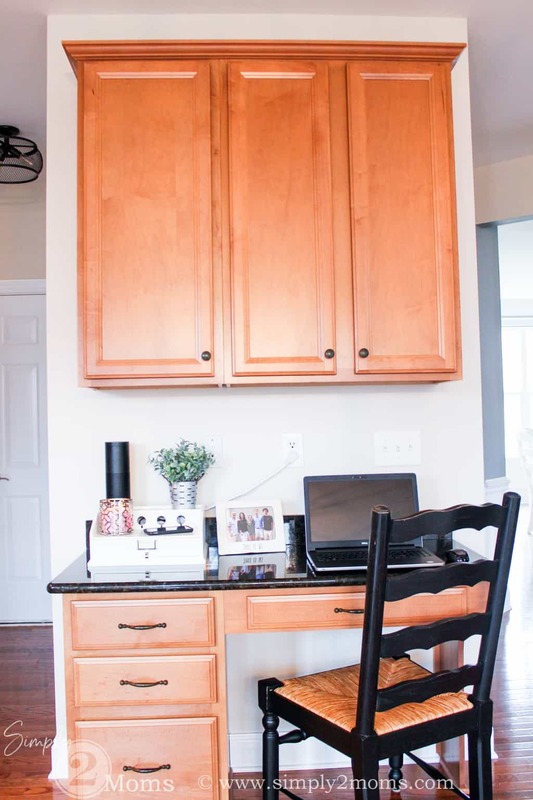 I just need to find something to hide the charging station cord & telephone outlet and this space will be perfect for us! Just a few hours of work and I now feel more organized with our paper clutter. And I have a pretty space that makes me smile every time I look at it! I call that time well spent! As an Amazon Associate I earn from qualifying purchases. What does that mean?